Can you believe it’s already August? This past year has flew by for our family, and before we know it, summer is going to be over and school begins! With all of the back to school purchases in your very near future – if you haven’t started already, I have made August’s menu, easy, delicious and best of all, inexpensive! This month’s meal plan has 31 days of no-repeat dinners for $152.49! Scroll down for recipes, a FREE printable grocery list and a printable menu to put on the fridge so everyone always knows what’s for dinner! You might be asking yourself, “how the hell did she manage to make this meal plan so cheap?” It’s possible, I promise, and if you shop the sales at your local grocery store I guarantee that you will save even more money. For example, in this meal plan, I priced out ground beef at $2.99 a pound, which is a pretty damn good price, but at my local Safeway, ground beef is $1.99 a pound this week, and that is a $4.00 savings right there for the month. To plan my meals, I use Walmart Grocery To Go. Walmart’s across the US are pretty similar in price, so I figured, like in the past, I’d use Walmart Grocery again to plan the menu. If you haven’t heard of it before, it is a service offered by different Walmart’s in select locations across the country, and you order your groceries online, and they get delivered right to your door step! It’s quite wonderful actually. Click here, and see if there is a Walmart Grocery in your area – if there is, save $10 on your grocery order and get FREE delivery! I guess that would be like a $142 for the month then! Cha ching! And no, this post is NOT sponsored by Walmart, but I wanted to share a referral link that I have with my readers, so save you even more money! If you’re looking for the printable menu and grocery list, scroll down to the bottom of this post, and click on the grocery list to download a PDF version for FREE! 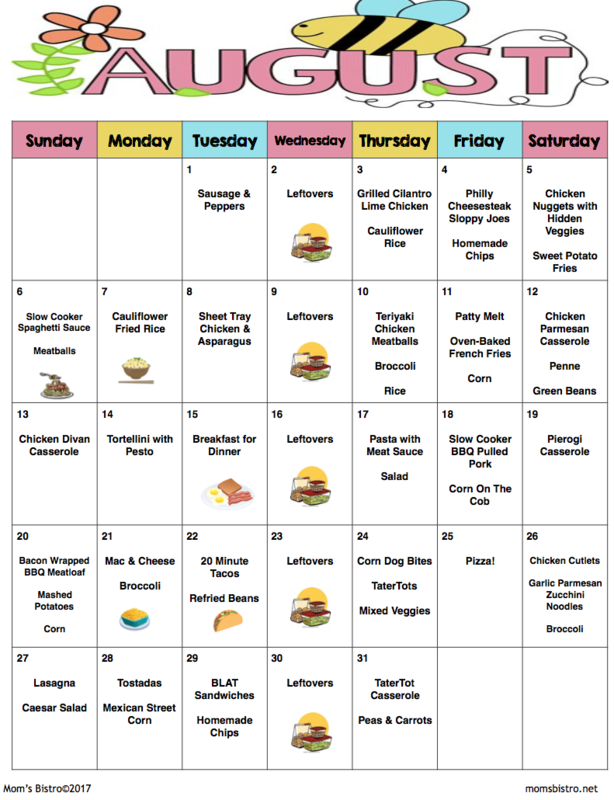 All of the recipes in August’s meal plan are designed to save you time in the kitchen, and money at the grocery store! That is it for this Month! Keep your eyes open at the end of August for September’s menu! And don’t forget to share this menu on Facebook, Pinterest and with your family and friends! White Mac and Cheese with Broccoli, Taco Lasagna and Chicken Stuffing Casserole. Will these be coming? Can I please get the taco lasagna recipe..you never posted it. The recipe was probably a new one for the month, and was not added to the original post. Also, I didn’t start printable recipes until late 2015. Please search the website with the search bar on the right, and you should find it! So glad I found your site!! I love this meal plan. What do you do for breakfasts and lunches? And for lunches, we would normally eat leftovers from the night before, or I make simple dishes like tomato soup and grilled cheese, bean and rice burritos, quesadillas with leftover meat and veggies, and pasta goes a LONG way for very little! I hope that this helps! How do you breakdown your shopping? Or do you buy everything at once? I usually shop for the canned goods, and frozen items that will last, and meats all at once, and then buy milk and produce each week. I use cash to buy my groceries too – this prevents extra spending at the store! I hope this helps! Is it just me or are some of the ingredients missing from the shopping list? I know the staples aren’t included, but if I had not double checked each recipe before shopping I would have missed some important ingredients. ie: the broccoli for the fried rice, almost all of the diy nacho ingredients, poblano pepper for roasted chicken, cream for the pasta with bacon and peas. Also the french fries that go with the cheeseburgers, am I’m assuming I’m supposed to hand make these? (since potatoes are included in the shopping list and not any frozen french fries). This idea is great, however I’m not sure how close I can be to the $152.49 as listed above with adding the rest of these ingredients. It also makes me a little nervous for the recipes that are not listed yet, since I can’t double check the ingredients to make sure they were included in the shopping list. I love this idea, I guess I just need to double check every recipe to make sure the ingredients are actually included on each shopping list. Thank you for noticing. I really do appreciate it. Sometimes I do miss things, and I do not mean to – but it happens. I apologize for this, if it confused you, or if it made things a little more difficult. The bread crumbs I usually include as my staples, because we use them so frequently – or more recently, I’ve been making my own. Again, I apologize for the confusion on the shopping list, and I appreciate you pointing this out to others taking a look at the menu and grocery list! God bless you! I typed ‘back to school meal planning’ into Pinterest and you popped up first. This is such an awesome system because I have 1 kid who will eat any and every thing, and another kid who eats nothing but PB&J for dinner. And trust me, I’m not that mom who makes multiple entrees… This simplifies my life SO much. Thank you Lindsie! How do you make your chicken enchiladas? The recipe will be posted for those this week. I hurt my foot, and have been out of commission for a while, and I got all backed up on posting the recipes! All the recipes will be available to print by the end of the month! I am slowly working to add a printable version to each recipe, and the menu itself. I am still enjoying your recipes…sorry about your foot. Everyone gets behind! For those who don’t know where to find a recipe…when you don’t have the new one up in time I go to allrecipes.com and find a recipe for which I already have the ingredients. ALSO a printable version will be awesome…in the meantime I use my snipping tool and print a week at a time. Maybe this will help some people. I can’t begin to tell you how much I love what you are doing! So helpful!!! I just came across all of your monthly menu’s and grocery lists – AMAZING! I know this is August, so you already have the September menu out, but I really liked the “sound” of some of these and wanted to look into the recipe but they weren’t included. Will they ever be included as we are past August? or is there a way I can look for the recipes myself? You’re doing an amazing job! 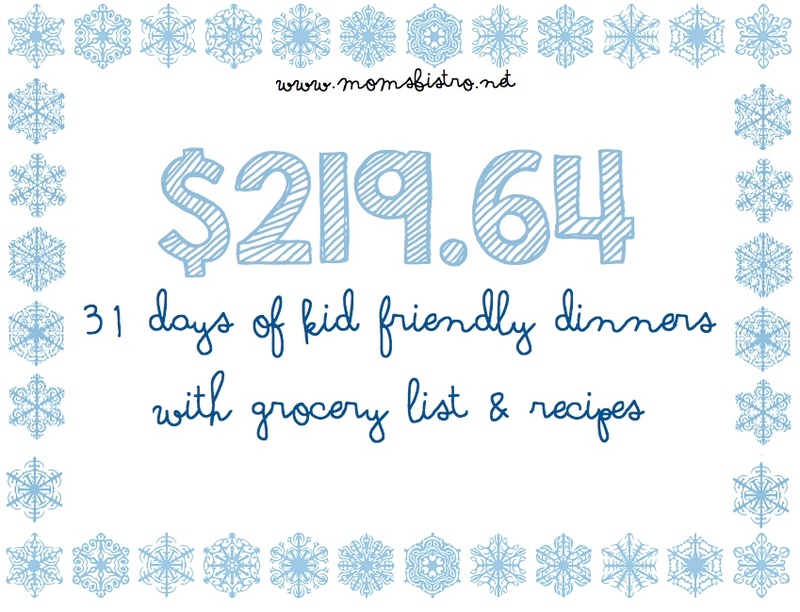 AND it helps other mom’s like myself with relatively quick, easy and fun dinners for the family! I also love the fact that most of these recipes my 4 year old can help me make! Keep doing an awesome job, THANK YOU! August was a crazy month, and I missed linking a lot of recipes. It’s on my list of things to do, to add the links. However, there is a search bar on the left of the screen – type in the recipe you’re looking for there and you should be able to find the recipe. Also, you could follow me on Pinterest for another way to access, and save the recipes! This the most amazing site that I have found! I come back here when I am in need of new ideas or totally overwhelmed at home and I can’t plan my meals. You are wonderful! I love the grocery list component that had been added! Thank you, thank you, thank you! !